Blueberries are here, and sungolds! Tomato quantities continue to creep up — maybe even enough to get through the whole weekend! No fresh baguettes this week or next. We have a good supply of frozen, though! We are coming now — or maybe squarely into — the season of bounty, when the food rolling in from the fields is plentiful. Some of these items will continue for a while — tomatoes have not yet even hit their peak, and sweet peppers haven’t even started — while others are here and gone before we know it. It’s when Dusty and I, and many of you, start thinking about how we can keep these flavors around throughout the year, or at least for a little while longer. Over the past few weeks, Dusty and I have frozen a few quarts of tart cherries, made a few pints and quarts of black raspberry jam, roasted those wonderful New Mexico green chilies, and canned a load of pickled Hungarian Wax (aka Banana) peppers. This coming week, I’m hoping we’ll tackle some peaches. I feel like we’re on a roll! 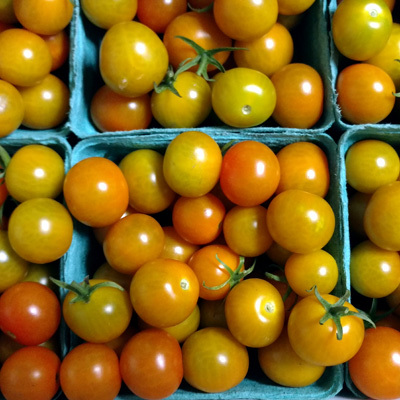 Last summer, we processed an INSANE 200 pounds of plum tomatoes. It was a two day project, and really the only thing we preserved last summer. I really don’t recommend going for that kind of scope. This year, we’ve so far stuck to some more reasonable quantities — things that can be accomplished in a couple of hours by one person — which is something I do recommend. As you may have seen on Facebook, my motivation for pickling the Hungarian Wax peppers is that through the winter and early spring, I was making a Mississippi Roast once every two weeks or so. The recipe calls for pepperoncini, and I usually use about half a jar each time. Dusty and I have made a lot of trips to the Sayford Market just to get pepperoncini. Now, I’m super glad that Sayford carries pepperoncini, but I did start thinking about how we’re going to all this trouble to make sure we’re using good clean beef and butter, I’m following a recipe that basically calls for making the ranch dressing part from scratch, and then I’m buying peppers that have all these added preservatives and colorings to pour on top? It feels like a broken link. Now, I don’t know any farmers growing real pepperoncini this year (but, uh, if you do know someone, please let me know! ), so I thought I’d try it with the Hungarian Wax. I started with about four pounds, which did all fit in my (very large) colander, but sure felt intimidating when I started slicing them up. Luckily, it did not take as long as I thought, and when I look now at my little stash of pickled peppers that resulted, the couple hours I invested seems well worth it, and I think on a $$ perspective it works out pretty well, too (at least if you already have the equipment). Of course I won’t know for sure if it was really worth it until I do a test run of the Mississippi Roast with them, and I want to wait a few weeks to let them get nice and briney, but I have high hopes! -My favorite canning/preserving book is Putting Food By, and I do recommend having a book you trust. I sometimes find recipes on the internet that look appealing, but when I compare them to the proportions published in sources I know to be reputable and safe, I get worried that maybe they’re playing a little fast and loose with the acid (or lack thereof). It’s not that you should never use an internet recipe, but I always feel more comfortable if I can compare it to something that I have more confidence in. -A lot of things can be canned in a Boiling Water Bath, but not everything. I’ve probably done more pressure canning than not, and I don’t find it too scary. -Using produce you’ve preserved is very satisfying. -Throughout the season, we’ll periodically be offering bulk quantities of less-than-perfect produce that’s perfect for canning, freezing, or otherwise processing. Some of these will be by pre-order and some will be just available for regular purchase. If there are specific items you’re interested in, though, let us know — there may be farmers who have small quantities of imperfect produce but not enough to advertise it. In addition, for many items, we’re able to offer a 15% discount for a bulk purchase if you place your order the week before. In other words, if you’re thinking about doing some preserving and would like help sourcing the produce, feel free to talk to us!